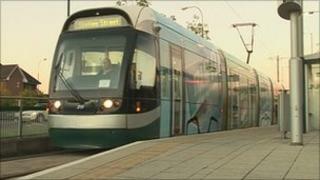 Traders fear closing a Nottinghamshire road for a year to allow for tram works could force them out of business. Shop owners in Chilwell Road and High Road, Beeston said they were happy with original plans for a one-way system. But this was scrapped after engineers said work could be done quicker if traffic was eliminated altogether. The city council said provisions would be made for parking, deliveries and emergency vehicles when work started in Spring 2013. The works are part of a £570m project to expand Nottingham's tram network to Chilwell and Clifton, and will see the road closed for up to a year. Tony Rogers, who owns Latino's restaurant, said people had cancelled bookings. "I know the work has to be done, but closing it is not going to help our business," he said. "Weddings and functions I already had booked have been cancelled because people aren't sure if we are going to be open or not, or whether they will be able to park here." Sheila Sangha, of Chilwell Road News, said: "I'm not happy about it at all. I'm going to lose a lot of business, I might even lose my entire business. "With newsagents people just pop in and out, but they won't be able to do that once the work starts." Chris Deas, NET project director from Nottingham City Council, said the work would be completed in two halves in order to reduce the impact on businesses in the area. He said: "The feedback we receive from all these detailed discussions will be used to help us to finalise how best to complete the tram works whilst still providing adequate parking, loading and servicing for businesses. "Our overarching aim is to carry out the works in as short a time as possible and to provide an environment in which pedestrians are safe and can continue to shop." Drop-in sessions for residents and traders to see the proposals are being held in the area in December.